Bangladesh, one of the rising countries in the modern world, got her independence in 1971, just only after five (05) years of Singapore. Singapore became independent in 1965. It is economically robust, a financial hub, and one of the Asian tigers along with South Korea, Taiwan and Hong Kong which are highly developed economics and fast industrialization between the early 1960s and 1990s. But it is a million dollar question and we should contemplate over head and ears how did Singapore grasp this prestige and how did they become success? And why did not Bangladesh flourish as Singapore did? Lee Kuan Yew, the first prime minister of Singapore, who is also called the father of the Singaporean nation, took a policy to progress the nation and that was “to develop Singapore’s only available natural resources: its people.” In order to making the human resources as the best, Singapore took the best strategy and that is enriching the education sector and that was incredible successful over outstanding and tremendous education and pedagogy strategy. Indeed, Lee Kuan Yew realized that the prerequisite of building a developed society or a country is well educated people and shadow of educated people in every division. The education structure of Singapore is considered the top in the current world. Accordingly OECD’s Programme for International Student Assessment (PISA), which is a worldwide exam directed every three years that measures 15-year-olds in 72 countries. About 540,000 students took the exam in 2015. Singapore ranked as the top consistently in main three categories of math, reading and science among the 72 countries where average score of Singapore in math 564, in reading 535 and in science 556 .Singaporean pupils are approximately three years ahead of their American peers in math. According to The Economist, An English- language weekly magazine, publishing from London, England originated some reasons why Singapore is so advanced in education even more than The US or UK.I will try to compare these reasons with the education system of Bangladesh. 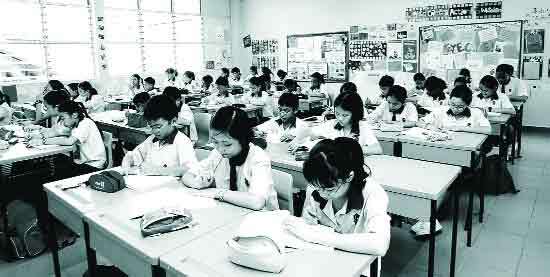 Firstly, Singapore invests heavily in education sector. .According to World Bank data, it invests 2.9% of GDP in the Education. This hefty investment accelerates education policy and helps Singapore to progress the education. And Bangladesh invests 1.9% of GDP in the education. There is substantial percentage of gap in the education spending of this two countries. Though Singapore invests more in their education sector, they can provide better quality education but it is obviously acerbic that due to having budgetary constraints Bangladesh can’t do. Therefore, Bangladesh should invest more to ameliorate education system for being Singapore. Secondly, Singapore emphasizes a narrower but deeper curriculum, and seeks to ensure that a whole class progresses through the syllabi. This fruitful syllabi effects a lot to the students’ performance in the classroom and out the classroom as well. They are becoming indomitable and getting handsome score in the different type of competitive tests (e,a-PISA test). But on the other hand, in our country, there is maintained a huge syllabi from beginning of studies (Nursery or playgroup) and pupils fall in the labyrinthine condition. Most of the schools compel the students to bring a lot of books at the very beginning of their student life, especially in many kinder garten (KG) schools and many private schools and which is lethal for the students. Sometimes, the school bags are too heavy to carry for the students. Thirdly, Education in Singapore is extremely uniform. Teachers are strict to a curriculum and focus on preparing their students for exams. They rely heavily on textbooks, worksheets, drills and practices. But in our schools, most of the teachers don’t teach appropriately in the classrooms (there are some good teachers also) and don’t make the lesson easier for the students and that is why students practice the different types of guide books which are greatly destructive for them. In Singapore, struggling pupils get compulsory additional sessions to help them keeping up; even the weak students, do comparatively well. But there is not coordination of this kind of additional classes in our schools or colleges. Though the financially solvent students go to the coaching centers or can take care from the home-tutors but those who are not solvent, cannot go to the teachers for extra hours and that’s why cannot learn well. In many cases, teachers are more interested in privately tutoring rather than in the class room. The teachers should be more devoted to complete the lessons accurately in the class room, therefore, all categories of students will be benefited. The most significant message we can learn from the Singapore for our education improvement is to focus on developing excellent teachers. In Singapore, they get 100 hours of training a year to keep up to date with the latest techniques and they are enough apt in teaching but what about our country? According to NAPE (National Academy for Primary Education) In Bangladesh, there are 57 primary training institutes, among them 54 government owned and rest 3 are non-government. Basically, this training institutes assemble training programs for newly hired teachers and don’t arrange up to date training programs for older teachers, hence, teachers can’t be advanced with the new teaching technique. However, most of the primary teachers teaches in the country side primary schools, they can’t be up dated by technology or other devices. Nevertheless, if we want to build a progressive populace like Singaporean, we should distillate more on primary education. In the high school level, there are 243553 teachers (BBS-2017) and a large number of teachers among them are not well-trained, let alone update training every year. They cannot deliver lecture appropriately and lack of training their teaching method is poor as well. So government should follow Singapore in this respect, and uphold necessary training programs for the teachers. Teaching is one of the respected professions in Singapore. According to Global Teacher Status Index (A 2013 study by the Varkey Foundation) Singapore graded one of the upper positions where there are great respect for the teachers. Countries with high respect for teachers are more likely to encourage their children to enter this profession, the report states. Singapore is also advanced in the paying of higher numeration to the teachers. On the contrast, less numeration is offered for them in Bangladesh and the society does not treat them as social leaders as well. Less esteem dispirit the meritorious students for choosing teaching profession. If you go to any school or college or university and ask them about their aim in life, the response would be detected like most of them don’t want be teachers rather doctors or engineers or administrators or government officers. If experts think about this and take productive decisions to attract the bright students to the teaching profession, I firmly believe Bangladesh will be Singapore very soon.